BBC Parliament this week repeated the BBC’s marvellous 1964 election coverage. 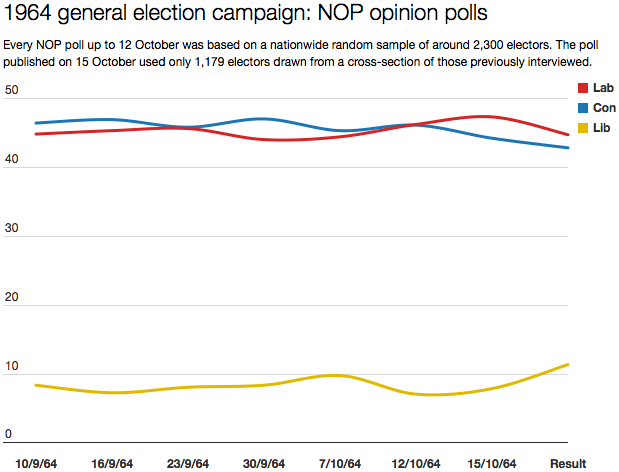 It prompted me to look at what kind of opinion polls were around 50 years ago. Were they as frequent as those published today – and how accurate did they forecast the result? 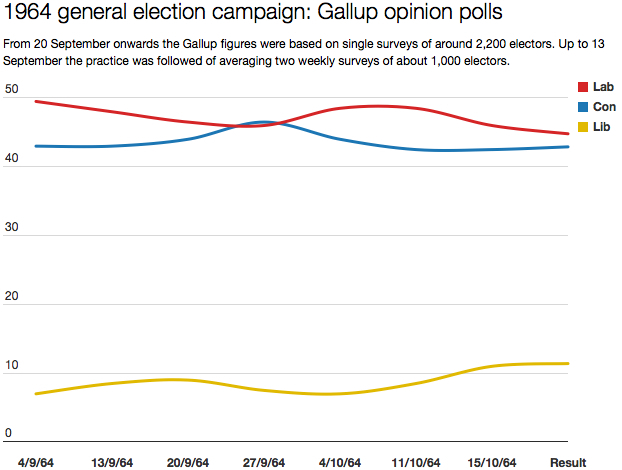 Only two companies produced regular polls during the life of the 1959-64 parliament: Gallup and NOP. Gallup was commissioned initially for the News Chronicle, but after the demise of that newspaper in 1961 publication switched to the Daily and Sunday Telegraph. NOP began at the start of 1961 and appeared in the Daily Mail. Both polls appeared monthly until mid-1963, when Gallup began publishing its results every Friday. NOP soon followed, and by the start of the election campaign the country was being treated to a double dose of polls once a week. Its final poll put Labour on 47.4%: almost a full three points above what the party actually won. The Liberals were down on 7.9%, 3.5 points below the final result. Only the Tories were anywhere close, being placed at 44.3% in the final poll and winning 42.9% in the election. What both Gallup and NOP picked up was a tightening of the race in its closing stages, and here both were proved accurate, as this did reflect the closeness of the eventual election result. The Daily Mail ran the headline WE DON’T KNOW above its report of NOP’s final poll, concluding that its findings suggested the result was too close to call. In the event the swing to Labour was decisive enough to see a change of government, but only just: Harold Wilson took office with a majority of just four seats. A couple of irregular series of polls popped up during the campaign. One set of four appeared in the Daily Express, and a set of two was published in the Observer. Neither were treated with much credence by politicians and pundits alike, largely because much of their methodology was kept a secret (a far cry from today). They are excellent indicators of opinions and voting intentions – to within a narrow margin of error. But it is that margin which decides elections. The small fluctuations that are recorded during a campaign may be vibrations in the measuring instrument rather than real changes in the nation’s heartbeat. A typically sharp insight that is just as true today as 50 years ago.